Breathe the fresh air and enjoy a nice breeze with this Amish Rocker that is sure to add that Rustic or Country look to your home. 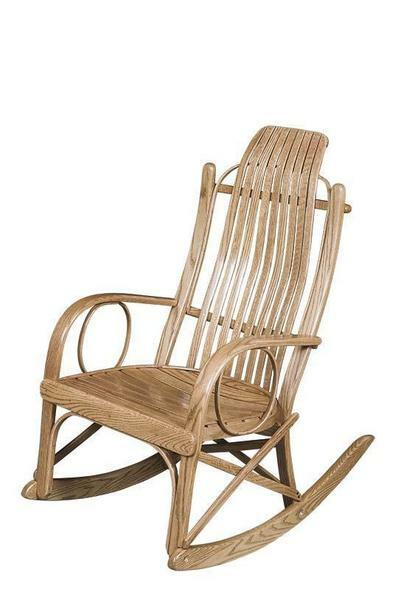 This Round or Bent Arm Rocker will make an excellent addition to your porch or patio. Handcrafted by the Amish, this Rocker is a quality American product that is built to last. This Rocker can be built to order with your choice of either Oak, Cherry, or Brown Maple Wood. With multiple stain selections as well, you'll be able to customize your Rocker just the way you like it. If you have any questions or concerns, please call 1-866-272-6773 to speak with an Amish Furniture specialist that is more than willing to help you. This Amish Round Arm Rocker usually ships within 5-7 weeks.